Nicolas Sarkozy and his Socialist rival Francois Hollande met head to head off in a heated televised debate four days ahead of a decisive run-off. 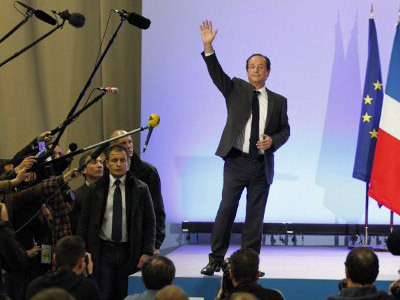 The debate was seen as the last chance for Sarkozy who trails Hollande to regain public support. The tense three-hour debate, which was watched by millions of French voters, covered a number of hot topics from economic policy to immigration. The Socialist leader started with pointed accusations that President Sarkozy had divided the French people. Hollande added that if he himself is elected, he will be a “president of justice.” He also accused Sarkozy of refusing to take responsibility for his record and accused him of self-satisfaction as the country’s economy struggles through difficult times. “Mr. Sarkozy, you would have a hard time passing for a victim,” said Hollande. “It's never your fault. You always have a scapegoat. 'It's not me, it's the crisis that hit me’. Whatever comes along, whatever happens, you're always satisfied,” Hollande declared. For his part, the incumbent president repeatedly accused his rival of lying about economic figures. Sarkozy denied that he has been a divisive figure and insisted that there had been no violence and no mood of “civil war” during his five-year term. “Mr. Hollande, when you lie so shamelessly, do I have to accept it?” he asked. As for the economy, Sarkozy says France needs to do more to cut spending and debts, while Hollande insists on government-funded stimulus programs. 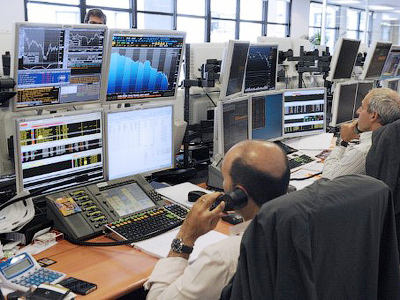 Sarkozy slammed his Socialist rival’s economic plans, claiming that Hollande’s promise to add 60,000 new civil service jobs would send France's debts sky high. With immigration being one of the most sensitive issues during this year's campaign, both candidates appeared to share some common ground as they try to scoop up far-right voters who supported Marine Le Pen. 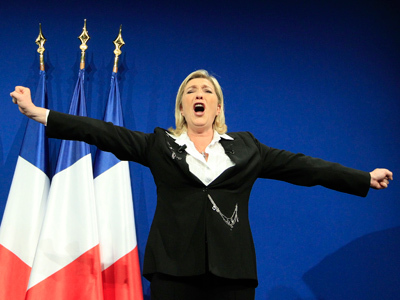 The National Front leader, who has refused to endorse either candidate, gained 17.9 per cent of the vote in the first round. Hollande also took a tough line on Muslim customs, saying he would apply the law banning the burqa across France. He also promised he would not allow separate menus in public cafeterias or separate hours in swimming pools for men and women in order to satisfy the demands of the Muslim community. The Socialist challenger is still ahead in the polls with the latest surveys forecasting that Hollande will win around 54 per cent of the vote. Both Sarkozy and Hollande made it through the first round of the French presidential election, with Sarkozy trailing Hollande by 7 per cent. 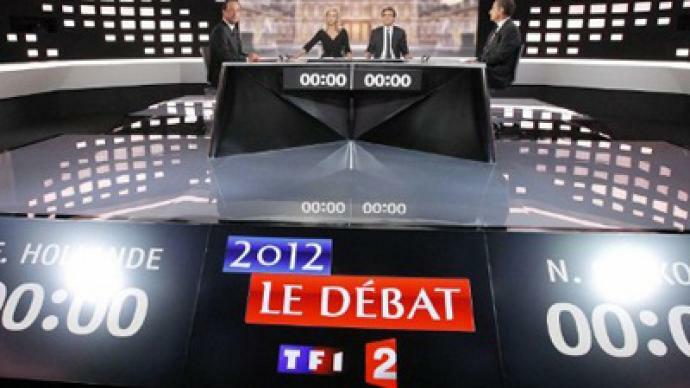 The televised debate is a traditional high point of the election campaign in France, offering voters their only chance to see the candidates up close and getting personal. In 2007, over 20 million people, which is about half of the country's registered voters, watched the debate between Sarkozy and Ségolène Royal, Hollande's former partner and the then Socialist candidate. The second round of voting will take place on Sunday May 6th.